Choosing the best outdoor rugs for rain was no easy task. However, we had a few requirements which made it much easier to narrow down our final picks. And, our first requirement was material that could withstand whatever Mother Nature dumped our way. Therefore, we needed a specific type of material which is both durable and water-resistant. After researching diligently, we discovered the best material to withstand rain is polypropylene. Polypropylene is extremely resilient while being lightweight. Furthermore, it can be hosed down for a good cleaning and dries quickly. So, if the polypropylene rug is left out in a torrential rain storm, the rug will be ready for use shortly after the skies clear. Our next requirement for the best outdoor rugs for rain was style. So, we chose an array of outdoor rugs ranging from classic, to contemporary, to artistic, and even a rug that replicates grass. Therefore, there’s something for everyone on our list. And, this particular requirement is often an afterthought, but we made sure our final picks are all mold and mildew resistant. In addition, we made sure all of our final picks are UV resistant. This helps to resist fading from the sun’s harmful rays and keeps the color looking sharp. Finally, we turned to you, the consumer. We wanted first hand accounts on how well each rug held up under less-than-desirable weather conditions. This enabled us to narrow down the rugs to the top 8 best outdoor rugs for rain. And, we must say, these are some gorgeous outdoor rugs. First up for best outdoor rugs for rain is a neutral-colored rug that will compliment just about any decor. The Oriental Weavers Karavia Outdoor Rug is made of 100% polypropylene and is constructed of a berber-weave, which makes it ultra durable. In addition, berber-style rugs are usually easier to maintain than your typical piled rug. This is because spills and dirt tend to sit ontop of a berber-style rug, whereas, with the piled rugs, it tends to seep through. Therefore, in order to care for a berber-style rug, all you need to do is use a mild soap and wipe it down with a damp cloth. 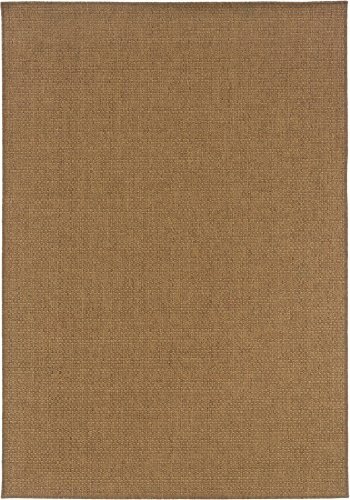 The Oriental Weavers Karavia Outdoor Rug is mold and mildew resistant. It also offers UV protection to prevent fading from the sun and other weather elements. 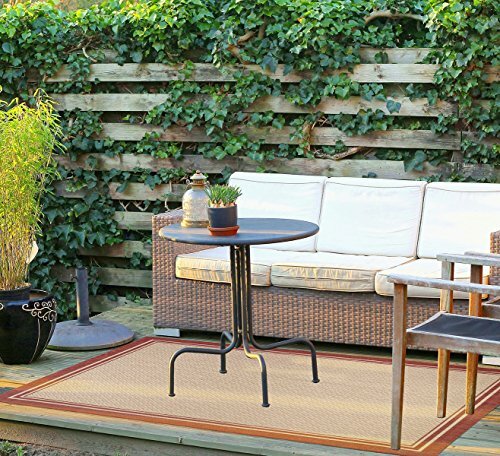 This outdoor rug comes in 14 different sizes, so you should be able to find a rug that fits like a glove. Furthermore, it also comes in a round and runner size. Because this rug is made with a berber-style weave, this will help prevent dirt and debri from seeping through. And, this makes it easy to clean and maintain. Additionally, it literally comes in just about every size imaginable. So, there’s no need to put in a special order to fit the dimensions you’re working with. This rug may slip and slide, especially in wet weather conditions. The good news is, they make outdoor rug pads for scenarios such as this. You can find a quality outdoor rug pad here. This pick for best outdoor rugs for rain incorporates earth-toned colors. Therefore, this rug will blend in nicely with just about any outdoor furniture. And, with this outdoor rug, you get your choice of 6 different neutral color and design combinations. Choose between: Angora Grey, Golden Brown, Nut Brown, Beige, Chestnut and Raven Dot Brown. 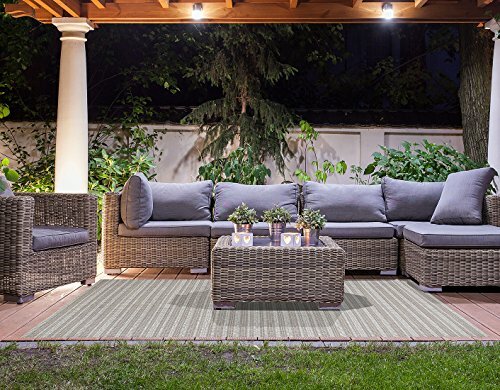 The Gertmenian Brown Jordan Prime Label Patio Furniture Rug is made of 100% polypropylene cabled yarn, woven in an ultra-thin, belgian-style of weave. And, like we mentioned above, a weave rug is easier to maintain and clean as dirt and debris tend to sit on top instead of seeping through. This pick for best outdoor rugs for rain is resitant to mildew, mold and stains and is antimicrobial. It is also easy to clean and care for, simply hose it off and let it air dry. Additionally, this all-weather outdoor rug is UV-stabilized. Therefore, it is fade resistant from all types of weather, from the hot sun to the strong winds. The Germenian Brown Jordan Prime Label Patio Furniture Rug comes in your choice of sizes. Choose between 5.25 feet by 7.5 feet, 8 feet x 10 feet, and 9 feet x 13 feet. This rug is elegant and blends in nicely with the outdoors. Furthermore, this is a high-quality rug with many consumers raving about how beautiful it looks and how durable it is. If you’re looking for a soft outdoor rug, this isn’t your best option as it is a little rough to the touch. However, the plus side is, because of the material, this rug handles harsh weather elements and cleans up very nicely. This option for best outdoor rugs for rain is a traditional-style rug that can go with just about every decor. And, it also comes in countless patterns which you can check out here. 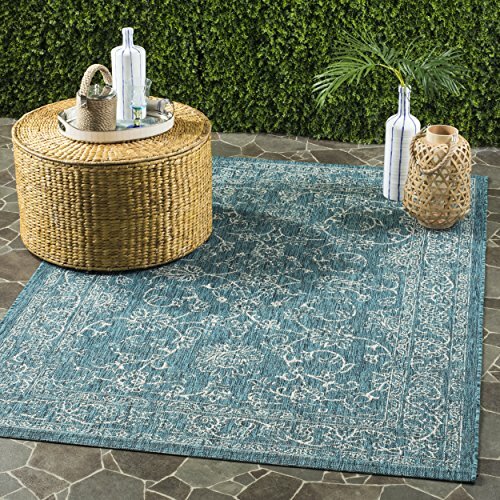 The Safavieh Courtyard Collection Indoor/Outdoor Area Rug consists of power-loomed construction made with high-quality polypropylene pile fiber. This polypropylene pile fiber is the softest you can get on the market, so in terms of outdoor rugs, this rug is relatively soft and extremely durable. This outdoor rug has a pile height of .25 inches and is mildew and mold resistant. In addition, it is anti-microbial and stain-resistant. To clean, simply hose it down and air dry. The Safavieh Courtyard Collection Indoor/Outdoor Area Rug comes in 3 different sizes. Choose between 2.3 feet by 12 feet, 5.3 by 7.7 feet, and 6.7 feet by 6.7 feet. As far as polypropylene goes, this is one of the softest outdoor rugs you will find made out of this material. This rug comes in many different patterns, which makes choosing a rug to go with your decor all that much more fun. It only comes in 3 different sizes, therefore, this rug may or may not fit the space you’re working with. Even though it’s made with the softest polypropylene available, it is still a little on the rough side. Unfortunately, this is the norm with all-weather rugs. This handmade outdoor rug is perfect for those residing by the beach or the lake. And, if you’re not feeling the surfboards, Liora Manne has many other “by the sea” designs to choose from. They are worth taking a look at and you can check them out here. The Liora Manne Whimsy Beach Boards Indoor/Outdoor Rug is made of 100% polypropylene. It is constructed with a tight weave to limit the amount of dirt and debris that may try to seep through. Therefore, this rug is easy to clean, simply wipe with a damp cloth and mild soap. This pick for best outdoor rugs for rain is UV-resistant. This will help to protect it from the sun’s rays and other harsh weather elements, such as, wind and rain. 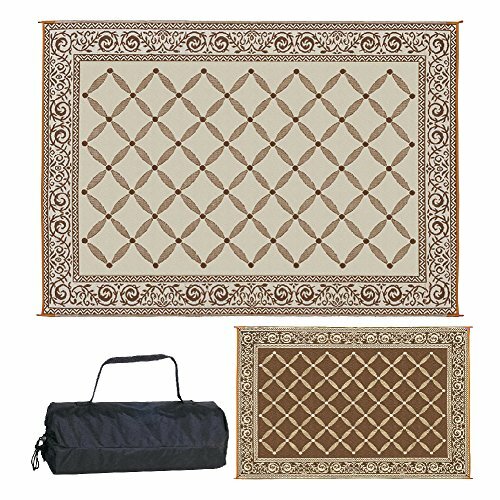 The Liora Manne Indoor/Outdoor Rug comes in your choice of sizes: 5 feet by 7.6 feet, 20 inches by 30 inches, 24 inches by 36 inches, 27 inches by 72 inches, 30 inches by 48 inches and 42 inches by 56 inches. This is a well-made rug with a tight weave which will help to prevent dirt from seeping through. In addition, this tight weave makes it easy to clean and care for. While this is an outdoor rug, it is not meant for heavy rain or other severe weather elements. It can endure some, but to keep its longevity, it is best to limit its exposure. Therefore, if you are set on this particular rug, be sure to bring it in when the dark clouds roll in. We love the simplicity of this particular design. And, this rug comes in 11 other designs – ranging from palm trees, to nautical, to starfish, to hibiscus, etc. The Gertmenian Nautical Tropical Carpet Outdoor Patio Rug is constructed of 100% Olefin. Olefin is the generic name for polypropylene, which is water-resistant and is known to dry quickly. Furthermore, this rug is power-loomed on Belgian looms. This process helps to increase the strength and durability of the rug, while giving it a nice, soft texture to walk on. The Gertmenian Nautical Tropical Carpet Outdoor Patio Rug is UV resistant which will help to keep the color from fading. In addition, it is resistant to mold, mildew and stains. Lastly, this outdoor rug comes in your choice of sizes. Choose between 5 feet by 7 feet or 8 feet by 10 feet. This rug comes in some fabulous designs. So much so, that it’s hard to choose just one. In addition, because this rug is loomed with a weave-like texture, it is easy to clean and maintain. Furthermore, this weave-like texture will help to prevent dirt and debris from seeping through. The pile height on this rug is 0.2 inches. Therefore, this may be a little thin for some. However, we find it creates a near seemless area to walk on. This pick for best outdoor rugs for rain essentially has it’s own drainage system. It is designed so the water drains through the fibers without soaking through. In addition, since water drains right through this rug, it dries quickly and is resistant to mold and mildew. The RRI Home Decor Sonya Indoor/Outdoor Oval Reversible Braided Rug is constructed of 65% soft polypropylene yarns and 35% nylon. It is UV resistant which will help preserve the color and keep it from fading due to sun exposure and harsh weather elements. This indoor/outdoor rug essentially has two lives. When one side becomes worn, it is reversible. So, you can simply flip it over for a fresh start. The RRI Home Decor Sonya Indoor/Outdoor Oval Reversible Braided Rug comes in your choice of 6 different colors: Brown Mulitcolor, Burgundy Multicolor, Denim Multicolor, Graphite Multicolor, Moss Multicolor and Sand Multicolor. And, it also comes in 8 different sizes, so the chances you will find a rug to fit in your space is pretty high. This rug works well in all weather conditions. Furthermore, when one side has had a little too much fun, you can turn it over and continue the party. A couple of consumers have stated that it snags and pills easily. However, most consumers seem happy with the quality. This pick for best outdoor rugs for rain is a rather fun one. And, you can use it for much more than just a rug. How about a quick game of tackle football? Or, how about just practicing your golf swing? 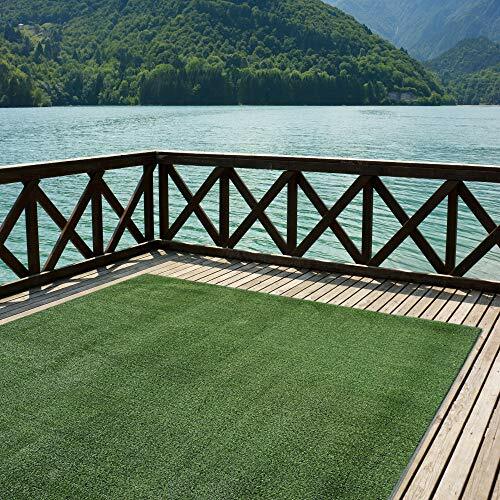 The iCustomRug Outdoor Turf Rug is made with 100% synthetic materials to replicate grass. 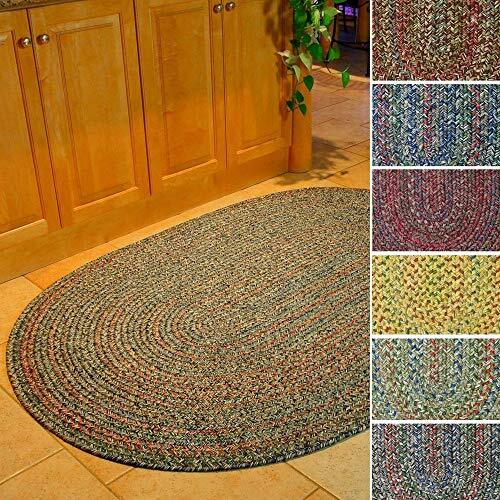 It is a low-weight, low-pile rug with marine backing. And, it features finished edges which will help to prevent the rug from fraying. This pick for best outdoor rugs for rain is actually rain-resistant. The rain drains through the rug, allowing the rug to dry quickly. In addition, it is UV-stabilized, which makes it resistant to fading due to the sun or other weather elements. Therefore, this will keep the artifical grass looking green. The iCustomRug Outdoor Turf Rug is easy to install, simply roll it out and leave it. Additionally, it can be staked into the ground to ensure it stays put. And, this rug is just as easy to clean as it is to install. Just hose it off and let dry. This rug comes in your choice of sizes: 5.6 feet by 6 feet to 20 feet, 8 feet x 20 feet, 11.9 feet by 4 feet to 26 feet. This rug is durable and will handle harsh weather conditions. Furthermore, it has finished edges which gives it a completed look. The iCustomRug Outdoor Turf Rug may shift and move with the wind. Therefore, it’s best to keep it staked into the ground or use under calm conditions. Additionally, some consumers have complained about the synthetic smell of this turf. However, given enough time, this rug will air out and will eventually have a neutral scent to it. Our final pick for best outdoor rugs for rain is an all-weather, stain-resistant, machine washable rug that will endure any weather condition. The Nourison Aloha Multicolor Rectangle Area Rug is made with 100% high quality, soft polypropylene. It is a flat woven rug with a high-low weave which gives it dimension and texture. This outdoor rug is easy to care for. Not only is it machine washable, but you can simply spray it down with a hose and let it air dry. And, like we mentioned previously, it is stain-resistant. The Nourison Outdoor Rug comes in a ton of different colors and patterns for you to choose from. And, you can find those colors and patterns here. 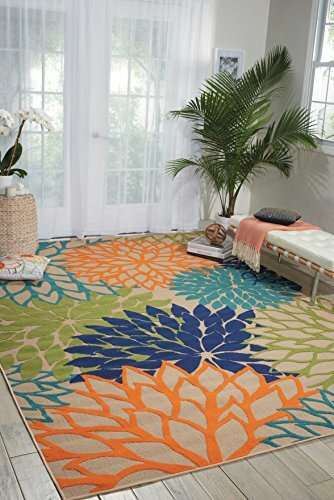 Finally, the Nourison Aloha Multicolor Rectangle Area Rug comes in your choice of sizes: 2.8 feet by 4 feet, 3.6 feet by 5.6 feet, 5.3 feet by 7.5 feet, 7.10 feet by 10.6 feet and 9.6 feet by 13 feet. This rug is stain-resistant and machine washable. And, this is great for when using it in high traffic areas. Additionally, it is textured with a high-low weave, which makes for a beautiful, contrasting design element. A couple of consumers have complained that the color faded after being left outside. So, you may consider using this rug under a covered porch.